Well, I’ve finally finished the guest room! It still isn’t perfect and needs some more accessories, but I thought I’d share it with you anyway! Here is the guest room before the make over. Plain beige walls and basically no decor. And here it is after! 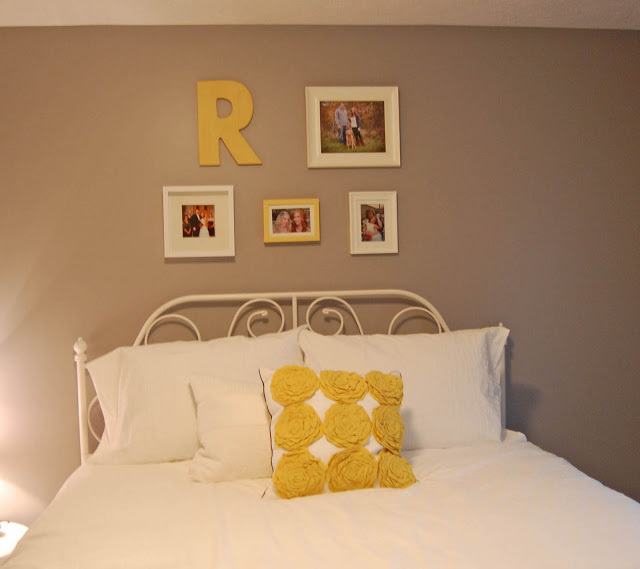 We painted the walls Behr’s Premium Plus Ultra in Cathedral Grey…and I love it! The grey really makes the white trim and accents pop! We also upgraded to a queen-sized bed so that our guests would be more comfortable. The light in these pictures is horrible….it has been so dark lately that it’s hard to get a nice photo. But trust me the color on the walls really is pretty. So far I just have the one yellow accent pillow…it’s from Target and it still has it’s tags on in case I change my mind about it, or in case my mom decides to make some cute pillows for me! 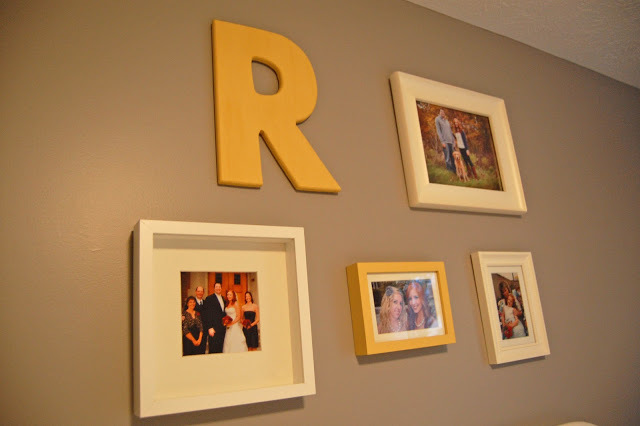 I found the wooden “R” at Hobby Lobby and painted it yellow. All the frames are from Hobby Lobby and Ikea. 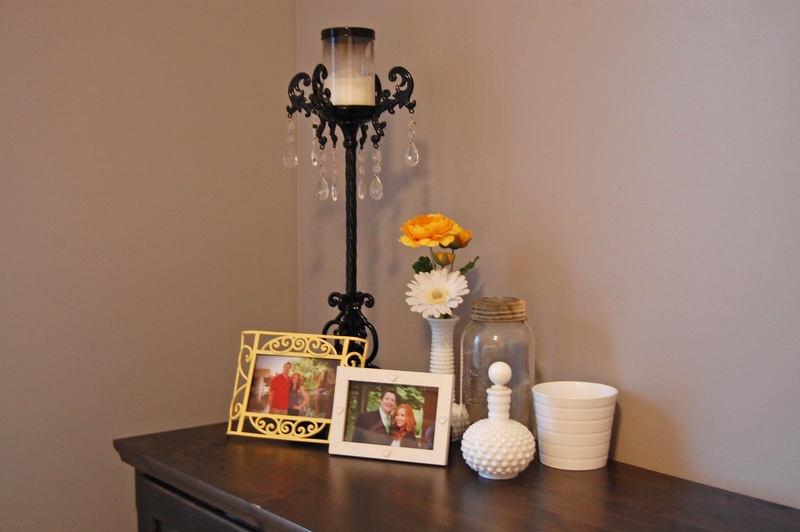 The goal is to have pictures around the room of us with the people who might be staying in this room…i.e. our friends and family. The bottom left picture is us with the husband’s family on our wedding day. The yellow framed picture is me with my friend Heather. The picture on the end is my absolute favorite of me and my mom when I was little. The top picture is the husband and I with Wrigley….that one will be swapped out for a friend picture as soon as I find a cute one! 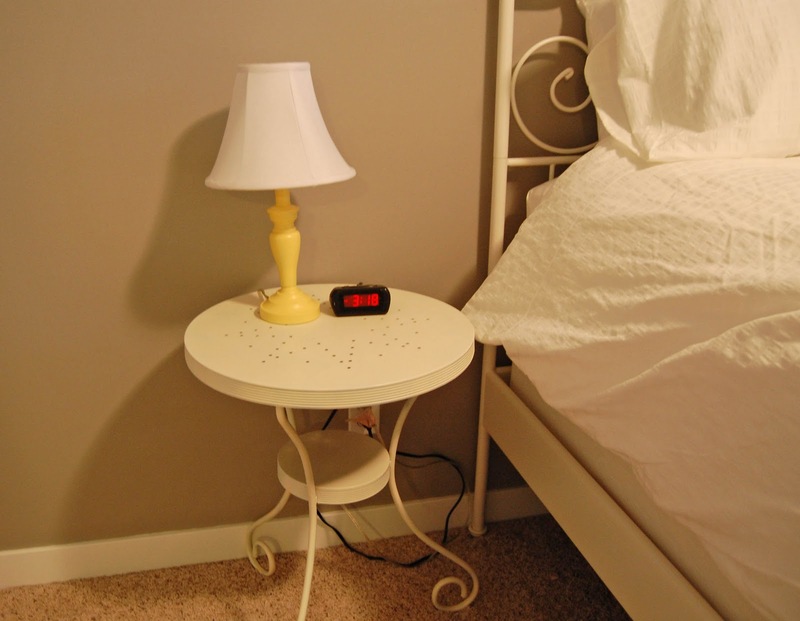 I also spray painted the bed-side table antique white and then spray painted a lamp I already had yellow. I’m still working on accessories in this room. I want to find a cute mirror to hang opposite the bed and get some more pillows. I love the yellow and gray combo. It looks great! I love the transformation!! I want a gray and yellow room now!! I LOVE it! I love the gray and all your new decorations. It looks great and very comfy. LOVE LOVE LOVE!!!! Like so much! The pops of yellow are perfect. I'm obsessed with white bedding now. And the photos above the bed. LOVE! I love the color scheme! 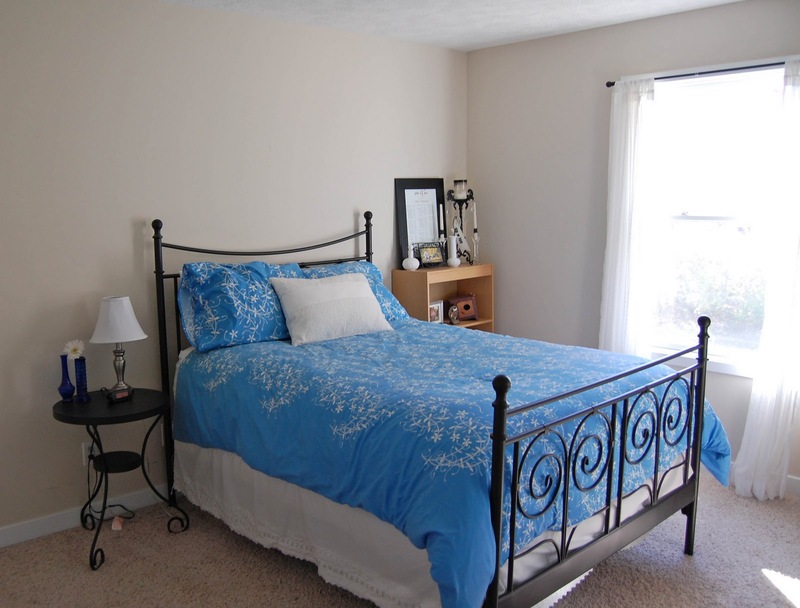 Such a great job on this room!! I adore it… I'll come stay anytime!!! So so so so so CUTE!!! I love it! It looks really great, but I LOVE the blue duvet in the first picture! It's gorgeous!! Everything looks great though — you did an amazing job! Love the make-over. All the pillows you have featured are so cute. I especially like the "LOVE" pillow you are going to make. Can't wait to come visit. WHO IS THE LUCKY GUY! 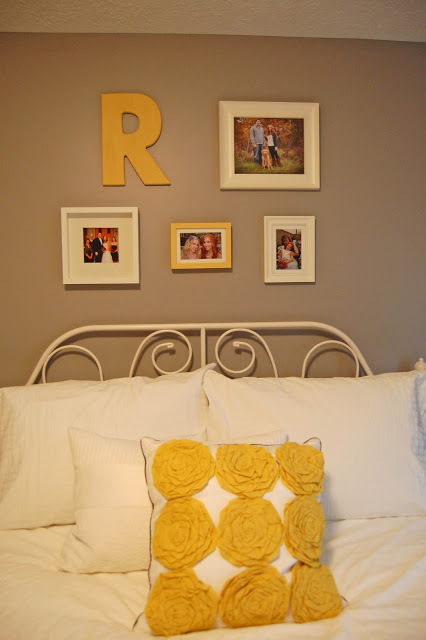 I LIKE THE BED ESPECIALY "R " "L "
It looks beautiful! My bed is the "before" full-sized Ikea bed…lol! When medical school is over, I can upgrade, but for now, I love it! Hello – I just came across your blog while googling for the right yellow paint to match the Cathedral Grey paint I've already put on one wall of our great room. Although I love that grey color, my husband thinks we need something bright to paint the rest of the walls. I was thinking about yellow, but not sure which shade of yellow will go with Cathedral Grey the best. I just love the yellow paint you used for R. Could you tell me the brand and name of that yellow paint? I'd appreciate it very much!!!! 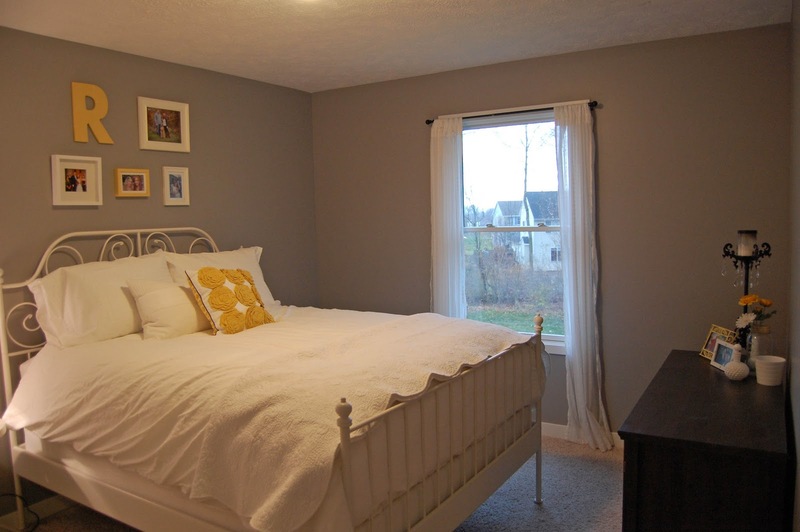 im painting my room grey and was planning on using behr brand paint– do you feel like the cathedral grey made the room feel smaller or just perfect? also, i was totally thinking of getting chevron patterened bedding, but i like how you did the chevron pillows instead with the pop of yellow, im thinking ill use it as an accent instead now! Julie you seriously give me so much inspiration for my home! I love everything that you do & you do it in such an inexpensive way! I love the colors, especially the grey!